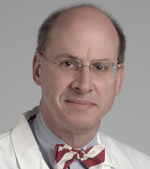 Despite a childhood interest in medicine which included making house calls with a physician uncle in Brooklyn, N.Y., and a summer job at a renowned endocrinology laboratory at Rockefeller University, James Stoller, MD, MS, chairman of the Cleveland Clinic Education Institute and head of Cleveland Clinic Respiratory Therapy, initially found himself considering a decidedly different career path. “That vision dissolved when I realized that I didn’t have the personality to do research in libraries with old tomes in solitude, and so declared a double major in biochemistry and then pursued medicine,” he said. After receiving his MD from Yale University School of Medicine, Dr. Stoller spent his residency at Peter Bent Brigham Hospital in Boston, and it was there that his interest in pulmonary and critical care medicine developed. Several years later, Dr. Stoller received an invitation to serve as the co-primary investigator of a National Institutes of Health (NIH) submission by the Cleveland Clinic, which was seeking to serve as the data coordinating center for the National Heart, Lung and Blood Institute (NHLBI) Registry for Individuals with Severe Deficiency of Alpha-1 Antitrypsin. In 2001, Dr. Stoller received his master of science in organizational development and analysis (MSODA) from the Weatherhead School of Management at Case Western Reserve University, where he currently serves as an adjunct member of the organizational behavior faculty. In 2007, Dr. Stoller was named as the inaugural holder of the Jean Wall Bennett Professorship of Medicine at the clinic’s Lerner College of Medicine, an honor he especially values for its personal connection. Moving forward, Dr. Stoller said he intends to continue exploring strategies to optimize the care of individuals with alpha-1 antitrypsin deficiency, and to continue developing and studying strategies to enhance physicians’ leadership development. “I see the latter work in organizational development as an attempt to contribute to medicine’s ability to navigate the challenging problems we face of cost, access, and quality by helping to empower colleagues’ leadership strength,” he said.